Katherine Chen’s Mary B. is a novel told from the point of view of Mary Bennett, the famously plain, ridiculed and unloved middle Bennett sister from Jane Austen’s Pride and Prejudice. Unlike her sisters Jane, Lizzie, Kitty and Lydia, Mary is presumed not to be interested in frivolities like men and fashion, as she is too often found with her nose in a book or playing the piano. In Austen’s original, Mary is a caricature, one of the many sources of humor in the book. Chen’s novel opens during Pride and Prejudice, soon after the Bennett’s odious cousin, Mr. Collins, comes to Longbourne. Before his visit, Mary confides to the reader that despite what people think of her, she has, in fact, been in love three times, immediately signaling that this Mary is not the same Mary from Austen’s novel. Mary B. explores those three relationships and how they shape Mary’s life and her future. I have so many conflicting feelings about Mary B. I have a lot of admiration for Chen, who clearly spent a long time with the original to develop the right language for Mary B. She’s faithful to the era and the writing style of the original, and that’s fun in and of itself. And I was happy just to revisit these beloved characters and extend my time with them. On the other hand, Chen took these familiar characters and sent them in some unexpected directions. Lizzie, Colonel Fitzwilliam and even Darcy turn into very different people from what one would expect of them. That’s Chen’s right, of course, but when you reimagine a book as beloved as Pride and Prejudice, you’re going to make people mad if you mess with what they love about it. I love Lizzie and Darcy – the romance of their relationship, the fiery passion, the intellectual connection – so I was pretty upset to see that relationship taking a different turn in Mary B. and I seriously questioned Darcy’s judgment. Other characters suffer similar fates: Charlotte Lucas, for example, who is so sympathetic in the original. 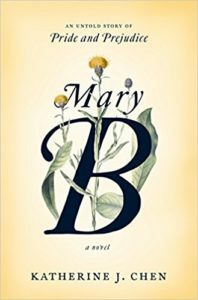 Mary B. is a darker and more bitter book than its witty, sly inspiration, for sure. I did appreciate Chen’s feminist update of the novel – Mary’s independence at the end is certainly an anomaly for her era. That was a nice twist. So if you want to read Mary B., approach it with caution and consider your own feelings about the original. If you can’t tolerate tampering, you might want to stay away. And if you’re looking for other books in the Pride and Prejudice-industrial complex, try Eligible by Curtis Sittenfeld or Longbourn by Jo Baker. I listened to Mary B. on audio. The narration by Marisa Calin was quite good, perfectly capturing Mary’s shrillness and judgmental temperament and showing off Chen’s skillful writing. I definitely recommend the audio. Posted on October 17, 2018 by gayle. This entry was posted in Audiobooks, Fiction and tagged Jane Austen, katherine chen, mary b, Pride and Prejudice. Bookmark the permalink.